Education Qualification : Specialist Finance- Passed M.Com/ PG Economics/ MBA/ PGDM (Finance) Degree with minimum 55% marks and 3 Year Work Experience in Similar Field. Specialist Risk Modelling/Data Analytics- Passed MBA (Finance)/M.Stat Degree with minimum 55% marks and 3 Year Work Experience in Similar Field. Specialist Forensic Audit- CA/ICWA with Forensic Accounting and Fraud Detection Conducted by ICAI and 3 Year Work Experience in Similar Field. Specialist Professional Copy Editing- Passed PG Degree in English with minimum 55% marks and 3 Year Work Experience in Similar Field(Hindi Knowledge Desirable). Specialist HRM- Passed PGDM/MBA in HRM/PM/IR/Labour Welfare with minimum 55% marks and 3 Year Work Experience in Similar Field. 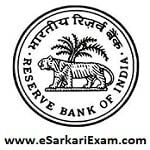 Eligible Candidates can Submit Application at the Official Website of RBI latest by 7th September 2018. Open Direct Recruitment of Specialist in Grade B Link.